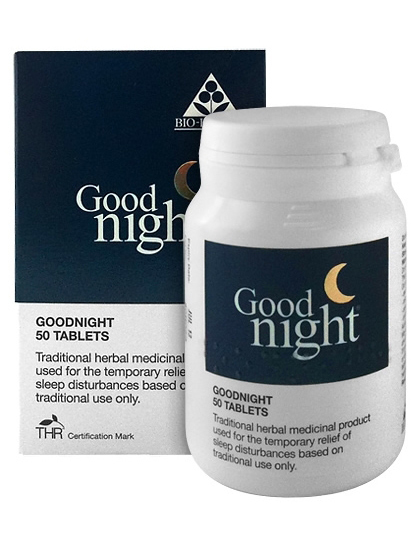 Bio-health Good Night Tablets For Sleeplessness. Sleepless nights mean restless days, bad temper and generally poor health. To sleep soundly and enjoy a new day is what most of us need to make life happy. Many people worry about taking sleeping tablets for fear of addiction. With natural herbal medicines there is no fear of reliance. 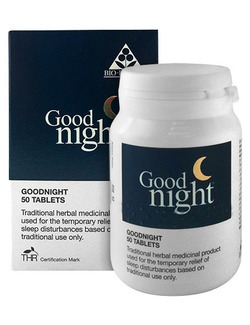 The most effective group of sedatives known to herbal medicine make Goodnight the ideal way to induce sleep naturally. Each plant sedative has unique qualities to make the well formulated product effective. (All information from ESCOP monographs, the British Herbal Pharmacopoeia 1983 and the British Herbal Compendium, Volume 1. For the relief of sleep disturbances, take two tablets, 30 minutes before bedtime. As treatment effects may not be apparent immediately, GOODNIGHT should be taken for 2-4 weeks continuously. If symptoms persist or worsen after 4 weeks of using the product, a doctor or qualified healthcare practitioner should be consulted.